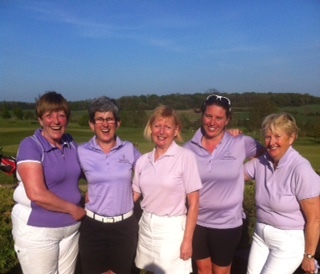 The 2nd Scratch Match was played at home on Sunday 8th May where we were hosts to Aldwickbury Park. Starting off with bacon butties and in complete contrast to the last match the forecast was for wall to wall sunshine and temps up into the high 70s. Proper Scratch golf weather!! This time our line up consisted of Pat Ward, Marica Kelland, Liz Cooke, Sarah Faircliff and on debut Emma Wood. Congratulations to Emma on receiving her team cap and winning her match against a lower handicapper! All the team contributed greatly to a 3-2 victory with wins for Pat , who scored 3 birdies, yes, 3 birdies in a row and completely overran her opponent!!! Liz was also a worthy winner! Thanks go to all the team for another great performance. The next Scratch match is at home to Harpenden on Friday 10th June.